Wash the bell/large peppers, cut the tops off, and remove seeds. In a bowl, place all the stuffing ingredients, but water. Mix them all and with a spoon fill the peppers up to 2/3 with the mixture. If desired, place one slice of tomato as a cap on top of each pepper. 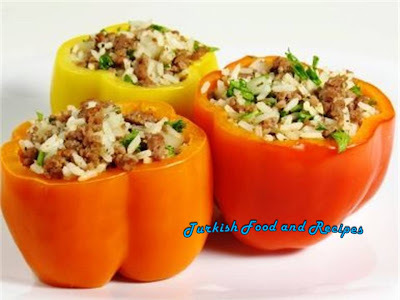 In a large saucepan or pot, place the stuffed bell peppers and add hot water, enough to almost cover half height of the peppers. Close the lid and cook on low-medium heat, until the peppers get soft and rice is cooked, for about 20-30 minutes. Serve hot or warm. Biberleri yikayin ve tepesini duzgunce kesin (ya da saplarini cikarin), cekirdeklerini temizleyin. Genis bir kaseye butun ic malzemelerini (su haric) alin ve hepsini guzelce karistirin. Bir kasik yardimiyla biberlerin icini 2/3’u dolu olacak sekilde doldurun. Her biberin uzerine dilimlediginiz domatesten bir parca koyun(istege bagli). Genis bir tava ya da tencere dibine doldurdugunuz biberleri yerlestirin. Biberlerin yuksekliginin yarisina cikacak kadar sicak su ilave edin. Kapagini kapatip, kisik ateste biberler ve pirincler pisene dek yaklasik 20-30 dakika pisirin. Sicak ya da ilik servis yapin. 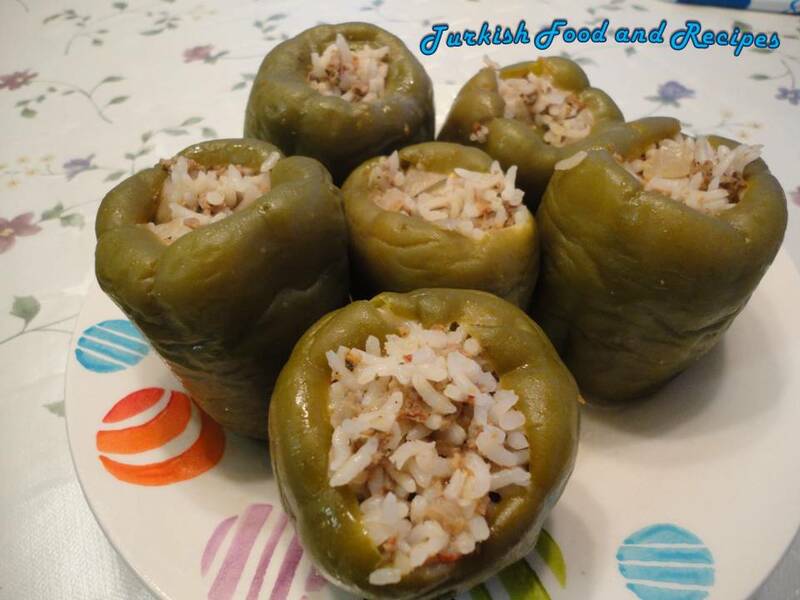 I have always like stuffed peppers. I will try yours in the near furure. 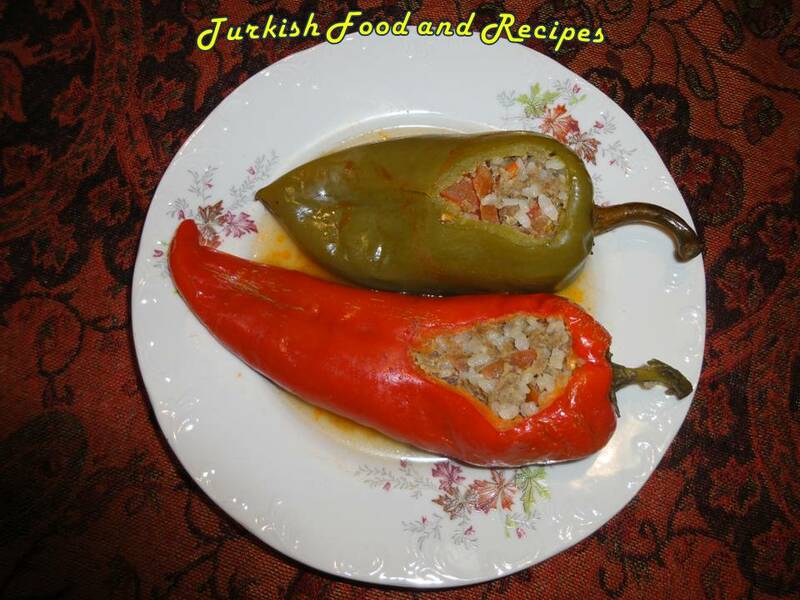 There's a Turkish restaurant in Maroochydore in northeastern Australia that offers Biber and Kabak and your stuffed peppers look just like what they serve. I'm dying to try this. Fingers crossed that it looks just like yours. Thanks for the recipe.